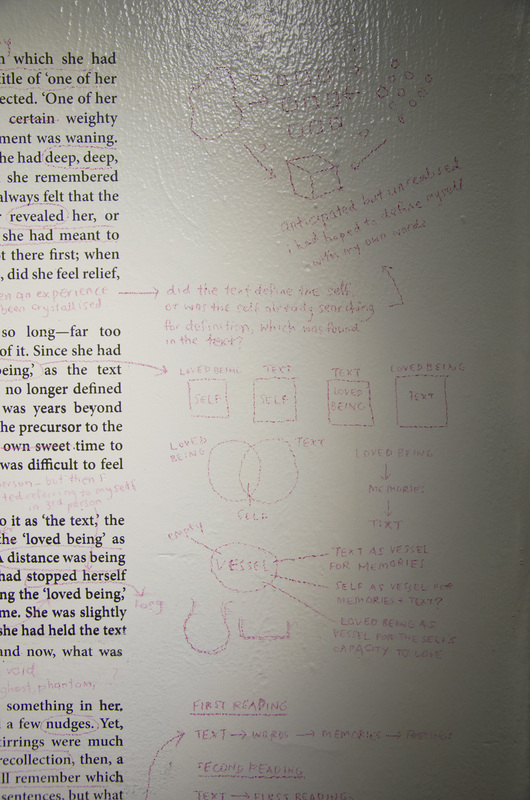 This site-specific diptych-installation draws from Roland Barthes's A Lover’s Discourse: Fragments. In the book, Barthes describes aspects of love and desire, in reference to an anonymous “loved being.” When I first read it, Barthes seemed to write everything that I had wanted to put in words – I fell in love with it. 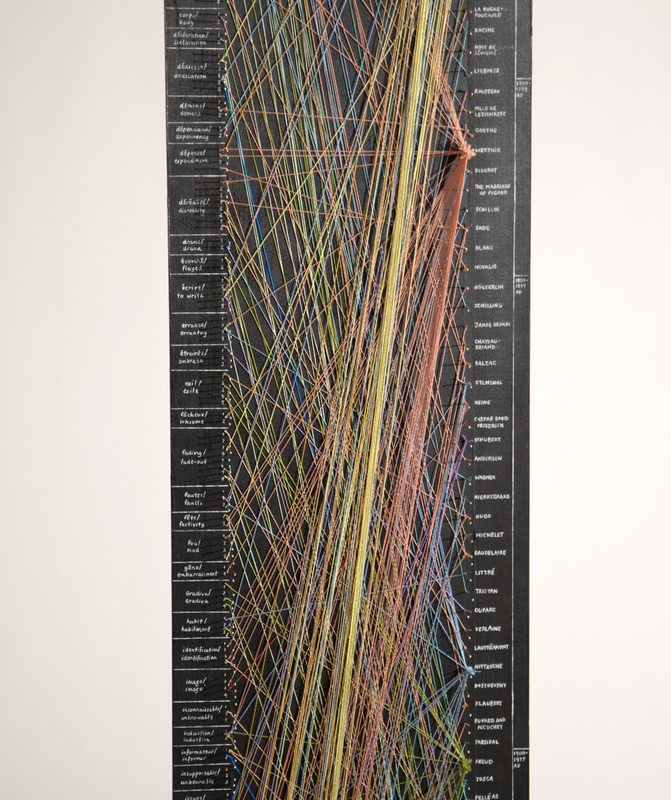 It was also the first book that made me think about creating infographics based on literature; Barthes referred to numerous authors, texts, conversations with friends, and so forth, which he listed in the margins of each chapter. Then, in mid-2013, I read it again, and found myself feeling disconnected – I had fallen out of love with it. At the time, I wrote it a break-up letter of sorts, in which I discussed my feelings about the text in third-person. Treating the text itself as a “loved being,” I paired the initial infographic concept with the prose piece. 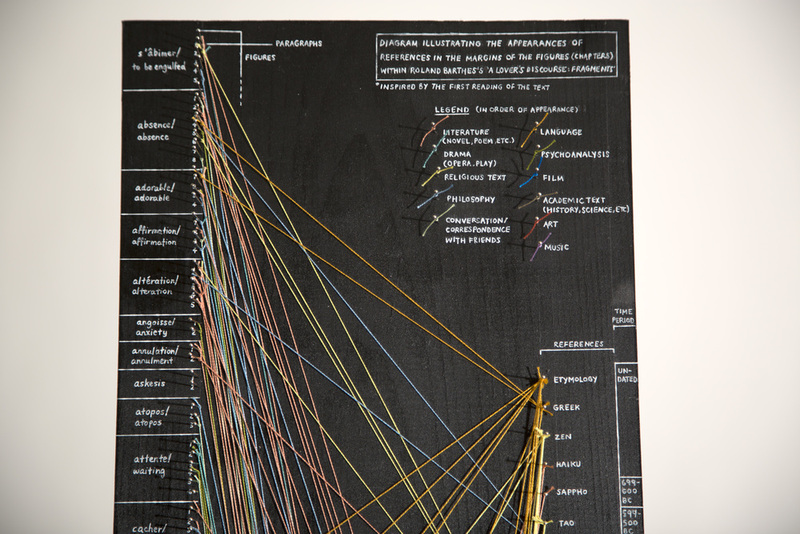 The former took shape as a sculptural piece in which pins and threads illustrated the information on a monolithic wooden base – I classified the references into broad genres associated with different coloured threads, then tied a thread from one pin (correlating to a reference) to another pin (correlating to a paragraph in a chapter). 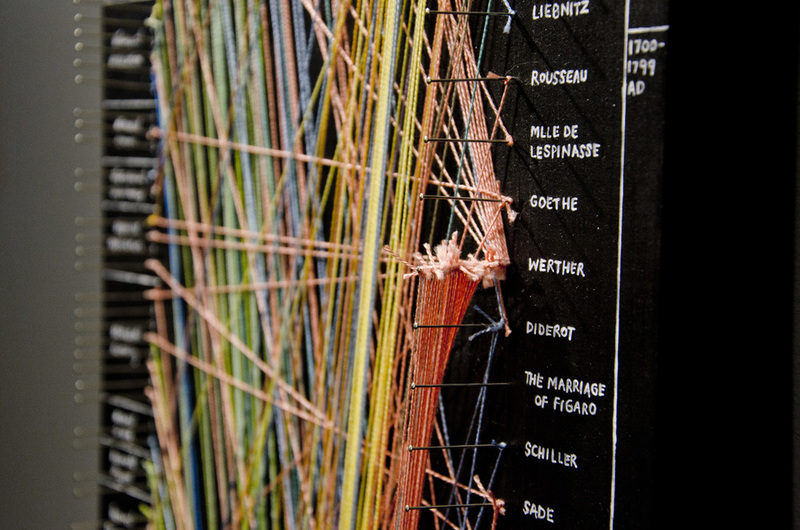 Multiple threads were allowed to build up on the length of each pin; for example, Barthes referred to Goethe’s The Sorrows of Young Werther 46 times, so the entire length of the pin was covered in knots. 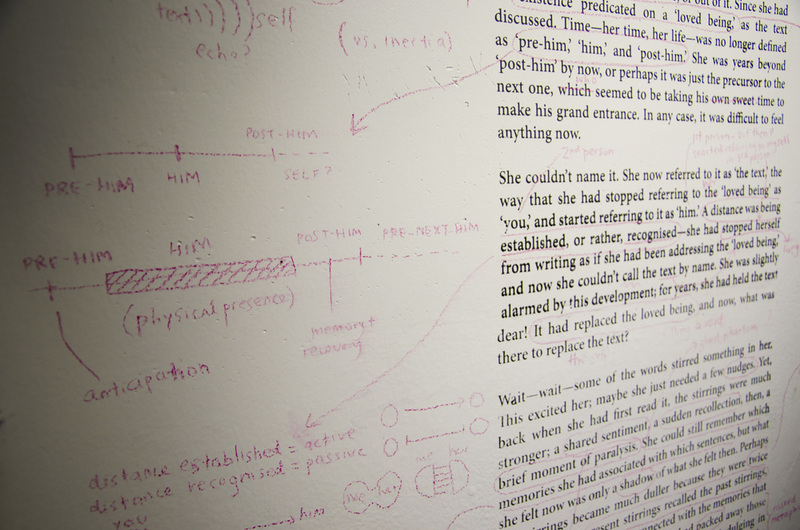 This three-dimensional diagram was put across the hallway from an elevator door, on which the text of the prose piece was screenprinted in a block of similar dimensions to the sculpture. 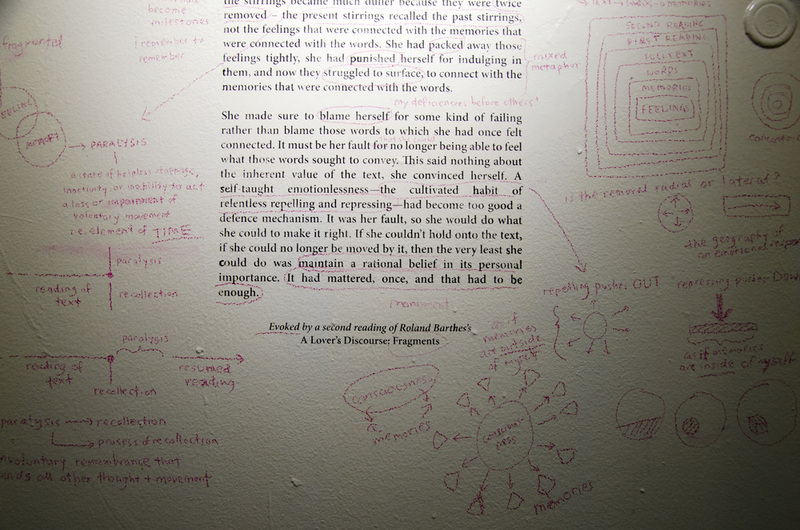 This was annotated with thoughts, corrections, and mini-diagrams using a pastel pencil. The inevitable opening and closing of the door rendered the text difficult to read in one sitting; like a fading emotion or a memory, it comes and goes. The text was eventually painted over to return the elevator door to its original white state. The reflective, ephemeral nature of the text stood in contrast with the monumental, obsessive qualities of the sculpture; together, they encapsulated the bloom and decay of love. 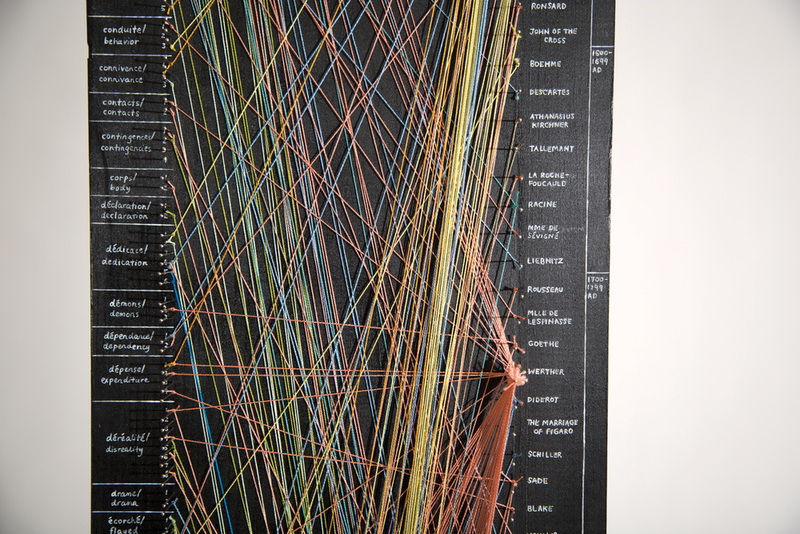 This work was exhibited in the VCS Spring 2014 Open Studios (1 May 2014), on the BFA Visual & Critical Studies Department floor at the School of Visual Arts.